There are so many fantastic shades of colors that are available to calligraphers. One color that is really fun to use yet can be hard to find is rose gold. This beautiful color can get lost among the other and more plentiful golds out there but still shines brilliantly on its own. In this post, we want to present the ink options we carry in our stock for you calligraphers out there who are in search of rose gold for your next project. This stuff comes in the form of a powder. However, these pigments can be turned into fantastic metallic calligraphy inks with the addition of water and gum arabic. 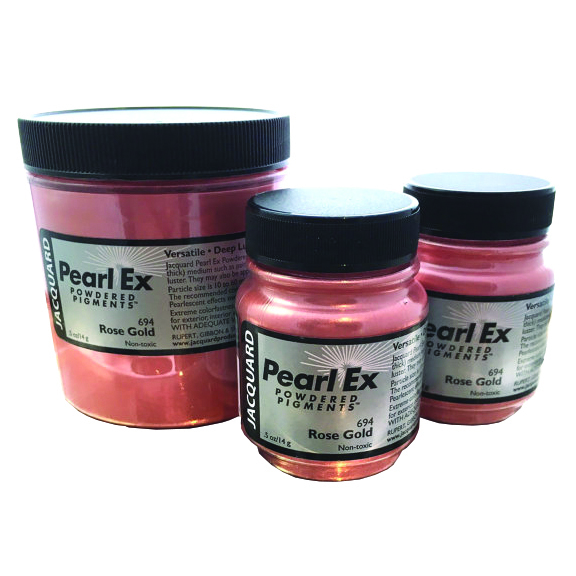 We know how much you all love The Rose Gold Pearl Ex. We now offer it in 1/2 oz and 4 oz jars! A few of the other colors we carry are offered in these sizes as well. Thank you @bienfaitcalligraphy for developing this gorgeous shade. Lumiere is used specifically as an acrylic fabric paint. However, it too can be blended with distilled water for use as a calligraphy ink. The Lumiere Rose Gold has the advantage of being more water resistant than the Pearl Ex Pigments and also has a slightly different yet still metallic look to it. If you prefer an acrylic based ink versus the water based of the Pearl Ex rose gold, then Lumiere might be the way to go. The Lumiere colors are available in 2.25 oz bottles. The Lumiere colors spread smoothly and stay flexible. Opaque and bright even on darker background. The hi-lite colors are best on dark backgrounds. They are also stunning on surfaces like paper, photos, wood, shrink plastic and even Styrofoam. Lumiere may be painted, stenciled, screen printed, airbrushed (when diluted) and stamped. If you are in the market for a nice metallic rose gold calligraphy ink check out the two products above on our website. Both options have to be mixed with either only distilled water (Lumiere) or with distilled water and gum arabic (Pearl Ex) but both of these rose gold’s provide a great color that really shines.